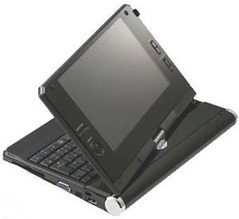 delayed until 2007/8 then this may be my next portable machine. That looks pretty cool. I've already decided I'm going back to apple after a gap dating back to the Apple II. How long is that!!!! I don't blame you. Chances are Apple wants the subnotebook form factor to be a tablet, but will they? Their sub will either be an overpriced tablet or an underpowered Macbook… and this from a Mac zealot.